Anna Wilson-Patterson’s current paintings explore her fascination with the haunting coastal landscape of the South East. 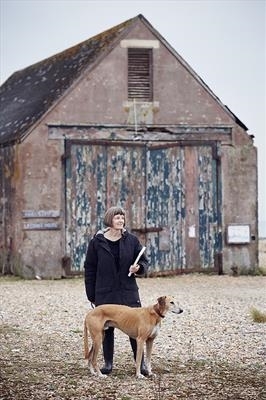 Walking her elegant hounds, she wanders the open vistas of shingle, sand and sea, punctuated by fishermens' shacks, railway carriages, groynes and wild flowers. “My gestures of adding, dragging and removing paint imitate the natural world, the tidal ebb and flow, the movement of clouds and wind. I am drawn to desolate, peaceful places. My subjects include huts, hounds and coastal plants." Anna qualified as an art teacher and worked in community settings, before running her own art gallery. She currently paints full time and exhibits in galleries in Sussex and Kent. She ships original paintings worldwide from her Etsy Shop and works with publisher artgroup.com She holds Art School for adults, at Winchelsea beach. 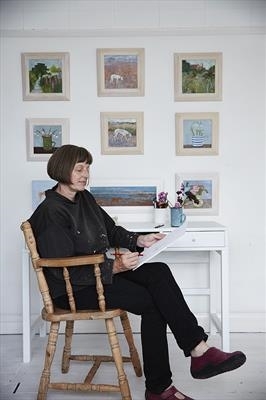 Her influences include the painters Joan Eardley, Winifred Nicholson and Tessa Newcomb. She lives on The Firehills in Fairlight Cove, where she holds an Open Studio every September. She also takes part in the Pop Up Emporium in Hastings and Rye Harbour Christmas Fair. She posts a regular visual diary on Instagram & Facebook. 2012 Ashdown Gallery, Forest Row.